A tiny gnome of a man with the countenance of an angel took the stage at the 1963 Newport Folk Festival and freaked out the rowdy audience (of mostly young white people) with his rendition of old-timey songster ballads and Mississippi folk blues to the accompaniment of an incredible syncopated three-finger guitar-picking style that he had taught himself a half century before on a “dollar-and-half” guitar that his mother had bought for him. After his triumph at Newport, Mississippi John Hurt went on back home to Avalon, Mississippi to pick his cotton crop. John Smith Hurt was born in 1893 in the Mississippi hill country of Carroll County, on the fringe of the Delta, in the tiny community of Teoc. While he was still a baby, his farming family moved to nearby Avalon, where he would spend most of the rest of his life. When he was nine or ten years old, Hurt decided he wanted to play the guitar and, having no one to teach him, he proceeded to develop his own unorthodox finger-picking style. “I grab it and go my way with it. Use my melody with it. I always tried to make my strings say just what I say,” was Hurt’s own explanation of his guitar style. He learned to play popular songs of the day, rags, gospel songs, and early blues tunes. 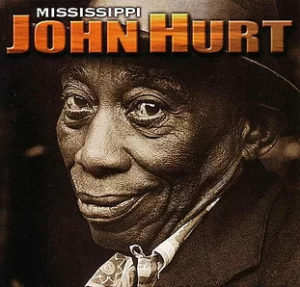 John Hurt never thought of music as anything more than an enjoyable way to relax from the arduous work of the cotton fields that was his lifelong occupation, except for a few months as a section hand on the Illinois Central Railroad and working for the Works Progress Administration during the Depression building roads and cutting timber. In 1928, a record producer named Tommy Rockwell came to Avalon to find Willie T. Naramour, a white fiddler who had won a chance to record for OKeh Records by taking first place in a fiddle contest. Naramour and his companion guitar player, Shell Smith, were popular Carroll County performers who would eventually record more than 30 sides for OKeh. One of their most popular numbers, Carroll County Blues, had been adapted from a tune Naramour heard a black field hand humming while he worked. The tune is still a standard at old-time fiddle contests and bluegrass festivals. John Hurt frequently played with Naramour and Smith when they were in the Avalon area, so when Rockwell asked them if they knew any more good musicians that he might record, they naturally gave him Hurt’s name. Valentine’s Day of 1928 found Hurt at the OKeh mobile unit in Memphis, sitting in a straight-backed chair with a microphone close to his lips. He put several cuts on wax, but only two—Nobody’s Dirty Business and Frankie—were ever released on a single 78 record. Subsequently, however, OKeh called him to New York City in December of that same year for two more sessions. He recorded several ballads, blues and gospel numbers, including his own composition, Avalon Blues, which would in time become his signature song. “Avalon, my home town, always on my mind. Avalon, my hometown, always on my mind. As a marketing gimmick, the word Mississippi was prefixed to his name and he was paid twenty dollars for each song and sent back home to spend the next 35 years with the anonymity of a sharecropper on a cotton plantation. In 1927 Hurt had married Jessie Lee, who was to remain his wife for the rest of his life, and they eventually became the parents of 14 children. John Hurt might have passed the rest of his life in obscurity if Folkway Records had not reissued two of the old OKeh sides as part of a series on American Folk music. A younger generation of folk and blues fans, hearing Hurt for the first time, became enthusiastic about his old style of blues. Even though Hurt was generally considered to be deceased, a blues researcher named Tom Hoskins, acting on a hunch and a clue from Avalon Blues (the line, Avalon, my hometown), traveled to that town, where he had no trouble locating the object of his search, the meek little old man who, at the age of 70, was still eking out a living in the cotton fields. When Hoskins showed up at his door, Hurt, who at that time was unaware of the Folkway releases, was completely baffled and suspicious of someone professing an interest in, or even knowledge of, those old recordings that he had made so long ago. Hurt even thought Hoskins must be from the FBI and said to him, “You’ve got the wrong man! I ain’t done nothing mean.” Still fearing that the young man was somehow connected with the law, Hurt agreed to go north with him because he thought that if he refused, Hoskins would arrest him anyway. Musicologists and blues aficionados were ecstatic to find a blues musician who was still playing and singing in an authentic style, untainted by commercialism or modern trends. Music historian and critic Nat Hentoff called the finding of Hurt the “most singular rediscovery” of the 1960’s blues renaissance. In July of 1963 Hurt recorded 39 songs for the Library of Congress and shortly afterward appeared before thousands at the Newport festival. He returned to Avalon to finish his crop, and then Hurt and his wife Jessie moved to an apartment in Washington, D.C. where he became the resident artist at the Ontario Place Coffeehouse. There was great demand for him to make appearances all over the U.S. and Canada. In addition to Newport, he appeared at most of the major folk festivals including the Philadelphia, Mariposa, and New York festivals. He kept a busy club schedule, appearing at the Showboat and the Brickseller in D.C, the Gaslight and Café A Go-Go in New York, the Second Fret in Philadelphia, and the Ash Grove in Los Angeles. He gave concerts at numerous colleges and universities, as well as appearing on several television shows, including the Tonight Show. Hurt’s income went from sharecropper’s wages of a few hundred dollars a year to thousands as an entertainer. Such a whirl of activity was overwhelming to this unassuming and gentle man. He never quite grasped what was happening. He made three albums for Vanguard, as well as recording for other labels, but he was uncomfortable with the business side of recording and could not understand people squabbling over the rights to his music. As soon as he saved enough money, Hurt moved back to Mississippi and bought a house in Grenada, a few miles from Avalon, but he did not have long to enjoy his new home and wealth because he died quietly in his sleep on November 2, 1966.